SARASOTA, Fla. (AP) In the new world of the Baltimore Orioles where youth and inexperience are the rule, there are two veteran pitchers hoping to prove they still have some skills. Last spring training, the Orioles added two free agent pitchers, Andrew Cashner and Alex Cobb, and both had substandard years. Cashner, who signed a two-year $16 million contract, was 4-15 with a 5.29 ERA. Cobb, who late in spring training agreed to a four-year, $57 million deal, had the worst season of his career, going 5-15 with a 4.90 ERA. "I don't want to touch too much on what we had going on last year," Cobb said. "I felt like there were a lot of times where we were going into competition without a full arsenal, far behind the competition we were facing, and that's frustrating." Baltimore was derided in the past because they lagged far behind what had become industry standard in the information age. "It's tough to go in there with a lot of confidence because you know how much more information is being given to the other side because I've been on the other side," Cobb said. "I feel like it's an even playing field now." Under new general manager Mike Elias and new manager Brandon Hyde, the Orioles are not only more analytically oriented, but they're a lot looser. Even better for the 32-year-old Cashner, they added pitching coach Doug Brocail to the staff last month. In 2017, Brocail was the Texas Rangers' pitching coach, and Cashner had one of his best seasons under him with an 11-11 record and 3.40 ERA. Brocail is a hard-nosed coach, but he and Hyde, who was the Chicago Cubs' bench coach last year, have brought a different tone to camp, adopting some of Joe Maddon's practices. 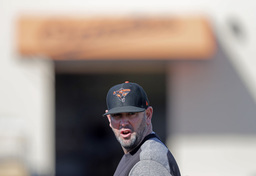 As the pitchers took the field for their first stretch on Feb. 13, suddenly loud music was blaring, a sharp difference from former manager Buck Showalter's tenure. "It's kind of a lot more fun," Cashner said. "I think it's kind of just trying to let everybody be themselves. It's not so much worrying about certain things as it is showing up and being the best ballplayer you can be. That's kind of the style (Hyde) had under Joe Maddon." Last season, Cashner missed time with a back strain, a neck strain and a knee injury that ended his season by mid-September. Good fortune and a new pitching coach could help. "I think my biggest thing is health, first and foremost," Cashner said. "I feel like I kind of struggled with that last year. Working with Doug is a treat for me, and it's special just because he played for so long and me and him mesh really well together." Along with Dylan Bundy, Cashner and Cobb are the most tenured starting pitchers Hyde has. "I think experience is important," Hyde said. "Especially the right experience, the right type of people, really good veteran guys do make a major impact in how they prepare, just watching them play." The 31-year-old Cobb had an awful start to his first season with Baltimore. Before the All-Star break, Cobb was 2-12 with a 6.41 ERA. He improved markedly in the second half with a 3-3 record and 2.56 ERA. Cobb is confident that with new management, the Orioles are on the right track. "I feel like we've got the guys that have been around the league, seen championship caliber organizations," Cobb said. "When you have those guys come in and have seen that much success and tell you that your stuff is good, it does play; we need to tweak a few things here and there, it's not a full rebuild, it gives you confidence."